Splendor largely gets it right on the dining front, offering everything that's become an industry standard, along with a few surprises: a super Indian tandoori grill, a stir-fry station and a generous sea day brunch. The Gold Pearl and The Black Pearl (Decks 2 and 3): Splendor's twin main dining rooms -- The Gold Pearl, aft, and The Black Pearl, midship -- are grandiose bi-level venues, so-named for the strings of decorative pearl-inspired accents that swirl through the room (along the lighting fixtures, carpets, ceilings and moldings). Seating a combined total of 1,866 passengers, The Gold Pearl is the larger of the two venues, with room for 1,122 diners, and also offers pleasant aft-view seating, overlooking the ship's wake. Dinner tables are assigned in two seatings -- at 6 p.m. and 8:15 p.m. -- or passengers can opt to walk in at whim via the "Your Time Dining" option (perhaps the reason there always seemed to be some congestion when at the dining room entrance). The majority of tables accommodate four, six and 10 diners with a limited number of two-tops. When the wait staff -- friendly and attentive as they are -- start singing and dancing, a signature Carnival twist, you know it is nearly time to say good night. The three-course dinner menu is robust and features a half-dozen entree choices each evening, including a "Comfort Kitchen" option that highlights comfort food like barbecued pork spare ribs, baked meatloaf and bacon mac n' cheese. Other entree choices are wide-ranging -- panko-crusted jumbo shrimp, Chateaubriand with Bearnaise sauce, seafood Newburg or perhaps broiled Maine lobster tail. There's always at least one vegetarian entree -- black bean and vegetable enchiladas or grilled tofu steak, for example -- and one designated healthy main plate, that's lower in calories, sodium, cholesterol and fat. A supplementary fixed "every day" menu offers favorites like shrimp cocktail and Caesar salad starters, and entrees like salmon filet or Southern fried chicken with mashed potatoes. Some half-dozen desserts include the line's signature decadent warm chocolate melting cake with vanilla ice cream that had our table repeat ordering -- and practically drooling -- night after night. Open-seating breakfast and lunch are offered in The Gold Pearl. Breakfast includes seasonal fruit, an array of hot and cold cereals and, from the bakery, muffins, bagels and toast. You'll find your standard breakfast entrees: smoked salmon with cream cheese and a toasted bagel, eggs Benedict, buttermilk pancakes, French toast and omelets and eggs made to order, along with traditional sides. We found the formal dining lunch selections fairly original -- among them, Mongolian steak salad, egg and spinach fettuccini and chilled curried apple soup. Especially popular here is the "Seaday Brunch" service (held on sea days from 8:30 a.m. to 1 p.m.) that allows passengers to sleep in and still dig in on brunch favorites like French toast, loaded mac n' cheese and huevos rancheros (plus, an extra-fee Bloody Mary bar). Special dietary requests can be accommodated when made at booking, including vegetarian, gluten free, kosher, low cholesterol, low sugar, etc. Dedicated kids' menus (with spaghetti and meatballs, chicken nuggets and other favorites) are on hand, too. Spendido Lido (Decks 9 and 10): The Spendido Lido, a self-serve buffet that rises two levels on the Lido Deck, is a crowd-pleaser because of its uncommon variety and its proximity to the pools, hot tubs, water slide and sun decks. With capacity for nearly 1,400 diners, there is plenty of indoor and outdoor seating, and enough ocean views to go around. However, the lines can get long, especially at breakfast, so be prepared for waits. In addition to the main buffet stations, including a "chef's choice" entree station, carving station, salad bar, dessert bar, burrito bar, Asian wok and upstairs rotisserie, there are smartly positioned satellite stations out on deck that serve Indian, New York deli-style sandwiches, hamburgers and hot dogs, as well as 24-hour pizza. There's also a well-used 24-hour soft-serve ice cream and frozen yogurt station. Splendido Lido serves a continental breakfast, beginning at 6:30 a.m., and then breaks out into a full-blown breakfast, offered from 7 a.m. to noon. This is a ship that stays up late and sleeps in -- it's not unusual to see cruisers enjoying bacon and eggs at close to midday. Breakfast includes a made-to-order egg station and daily specials like eggs Benedict, an egg-and-cheese burrito and cheesy chicken rolls. The buffet lunch can be pretty grand. At the Mongolian Wok, for instance, you select a bowl of fresh vegetables -- onions, mushrooms, snow peas and carrots, for example -- that the chef then fries with chicken, salmon, pork, duck or squid. There's also a choice of sauces: black bean, Thai barbeque or Sichuan. Every day, look for a rotating selection based on the chef's choice, featuring, for instance, a French, Caribbean or Mexican culinary theme. Last but not least, the dessert bar tops lunch off with selections that include cherry Jell-O, Linzer torte, orange diet cake, banana cream pie and cookies. Evenings, from 6 until 9:30 p.m., Splendido Lido serves buffet-style dinner. It's not terribly inspired, but sufficient for a laidback night of dining. The salad bar and carving station will seem familiar because they're a repeat from lunch, but the entrees, at least, are fresh and mostly come from the same menu served in the ship's main dining rooms. You won't see each and every menu item, of course, but there's a sampling that, on our cruise one evening, included penne alla Siciliana, lemon confit-topped grouper fillet, grilled flat-iron steak and cinnamon, pumpkin squash and yam pot pie. Among the featured desserts were diet New York cheesecake, amaretto cake and cherry upside-down cake. There's no wait staff in Splendido Lido, so if you want a glass of wine or an aperitif to accompany the meal, you'll have to walk to a poolside bar to get one. Room Service: One weak link in Splendor's offerings is the complimentary room service menu. The Continental breakfast is fine: cereals, fruit, smoked salmon, breakfast breads, yogurt, coffee, hot chocolate and juices. But, the 24-hour menu pretty much begins and ends with sandwiches (true, there are 12) and salads (just two). There are also a few desserts, but overall, the menu is scant. The Pinnacle Steakhouse and premium coffee bar are the only venues that come with an extra price tag, which seems like a fair deal, given the standout quality of the steakhouse and the otherwise ample complimentary offerings. In the main dining rooms, there's additionally a "Steakhouse Selections" option featuring grilled lamb chops, broiled filet mignon and prime New York strip steak entrees, at a supplement of $20 per person. On a select sea days, the main dining room also hosts a "Green Eggs and Ham Breakfast," a play on the line's Dr. Seuss partnership, which features characters like the Cat in the Hat and Seuss-worthy plates like, well, green eggs and ham, of course ($5 per person). The Pink Pearl (Deck 3); $75: Available on all of Carnival's ships, the Chef's Table dining experience affords up to 14 participants a multicourse dinner with a master chef, a private cocktail reception and a tour of the galley and its operations. On Splendor, this dining option takes place in the 28-seat Pink Pearl (an annex to The Black Pearl main dining room). The experience can be booked onboard at the guest services desk for a per-person cost of $75 (for ages 12 and older only). The Coffee Shop (Deck 5); priced a la carte: Like most ships, Splendor has a premium coffee bar that sells barista coffee, herbal teas, iced lattes, milkshakes, cookies and cakes, which are not priced at more than a few dollars each. This stand-up coffee bar-style spot seems to always be buzzing on the popular Promenade Deck, which houses the casino, multiple lounges and shops nearby. 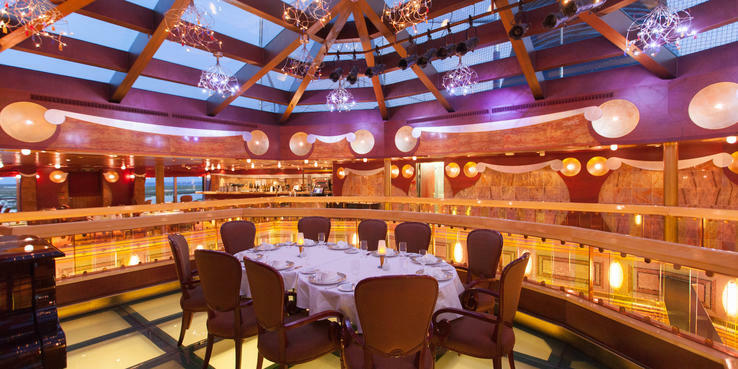 The Pinnacle Steakhouse (Deck 11); $38: The Pinnacle, at $38 per person, is a great value when you consider the robust menu and polished service, and the stylish top-deck venue. Reservations are recommended at the 108-seat eatery, which oozes classic American, Art Deco-style steakhouse decor. As for the menu, starters include options like escargot, beef carpaccio, jumbo shrimp cocktail and lobster bisque. The salad selection is basic but serviceable with choices like a classic Caesar or baby-leaf spinach and mushrooms. Selecting your entree can be a brain teaser, given the expansive options -- among them are broiled New York strip loin, filet mignon, surf and turf, broiled lobster tail, rosemary-infused chicken and grilled lamb chops. The dessert menu is no less tantalizing: cheesecake with a hazelnut biscuit, caramelized Washington apple pastries, a chocolate sampler and fresh fruits or international cheeses. When the maitre d' tells you to expect to linger over dinner for as long as two and a half hours, he means it.